If there is one restaurant that has become mythical over the years, it's Thomas Keller's The French Laundry in Yountville, California. 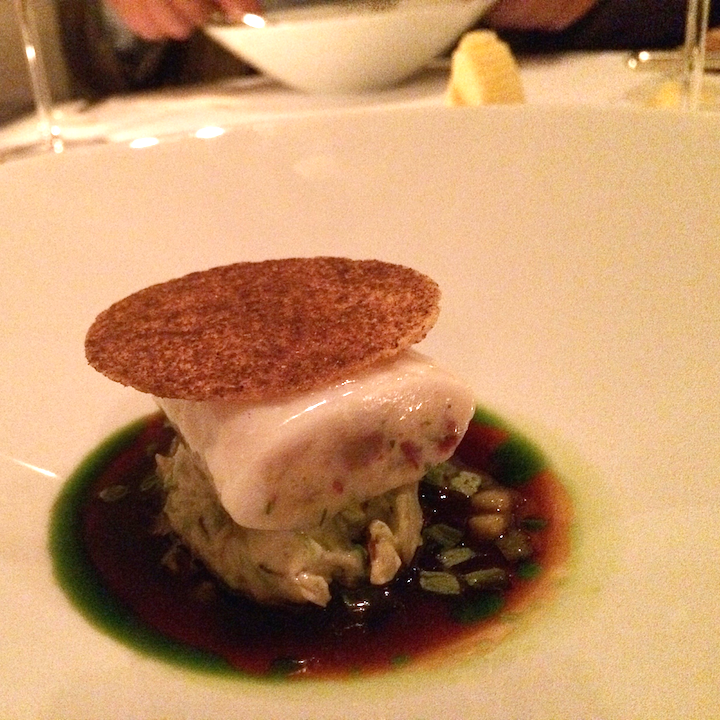 Mythical because The French Laundry remains one of the toughest reservations in the world. It is at least, if you go at it the old fashioned way, and you just call them and try to book a table, without the help of a Black Amex or another concierge service. And I'm not exaggerating here. Just last January the California Lottery set up an "Ultimate Food Experience" prize, where the grand prize was a meal for two at The French Laundry. 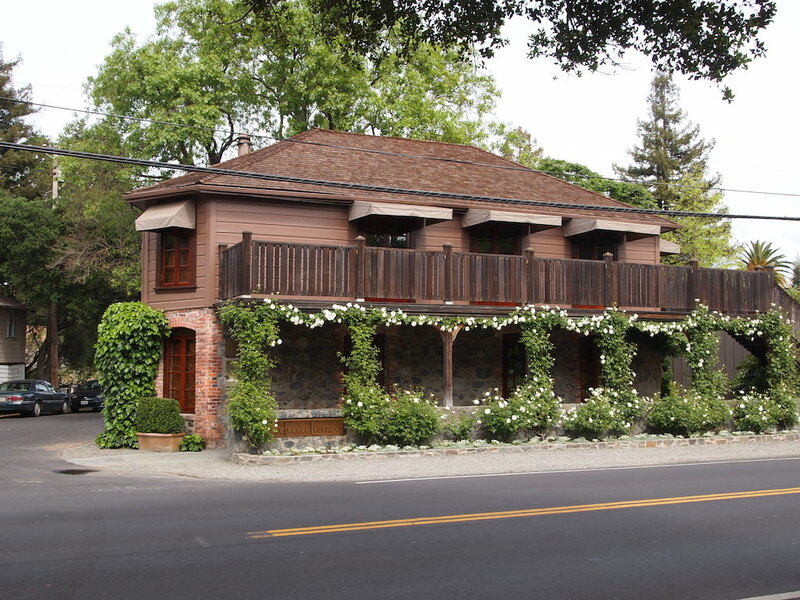 Anyway, when I planned my trip to California, I did realise that a meal at the French Laundry was probably not on the cards for me, because they had been closed since January for an extensive renovation/expansion (including a brand new kitchen). I was in California early April, and what do you know, while I was there The French Laundry announced they would reopen April the 7th with a temporary kitchen, housed in four metal shipping containers. Eater San Francisco mentioned in their article: "If you've been trying to get a table, now is the time". These were my thoughts exactly, so I tried calling them ...... for two days ....... and I failed miserably. They didn't even answer the phone. Then I had dinner at Dominique Crenn's restaurant Atelier Crenn in San Francisco, and she kindly offered to help me to get a reservation at The French Laundry. She did. Hallelujah, I was in. The French Laundry has around 60 covers, with two seatings, and is open for dinner 7 days a week, and for lunch on Saturdays and Sundays. The restaurant offers a 9-course tasting menu (including a vegetarian option) for $295. Some courses provided a choice of dishes, but depending on the dish, the alternatives on offer carried a supplement charge of $40-$100. 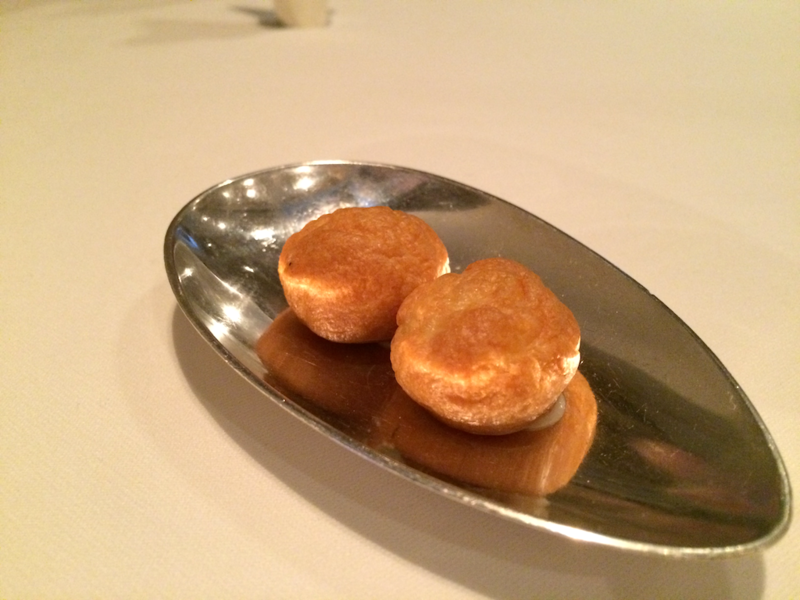 I had dinner with my husband at The French Laundry on Wednesday 8 April 2015 and I ordered one supplement dish (the foie gras) priced at $40. Dinner started with a selection of canapés. First to arrive were some delicious Gruyère cheese gougères filled with a warm and creamy Mornay sauce, followed by The French Laundry's iconic salmon tartare cornets. A crisp cornet is filled with onion crème fraîche and topped with finely chopped Scottish salmon tartare. A pleasing combination and the salmon tartare was beautifully seasoned. Then there was a lovely chilled and velvety green asparagus soup with asparagus tips, followed by "Oysters and Pearls", a famed French Laundry dish that is always included in the tasting menu. Creamy tapioca sabayon is served with oyster-butter sauce, chopped Island Creek oysters (lightly poached in the butter sauce), and finished with a quenelle of white sturgeon caviar. Loved the butter and oyster sauce which was perfectly balanced, with nice oyster flavours in the finish. The tapioca sabayon had a lovely texture with a light creaminess to it, but the outer layer/ring on the inside of the bowl was ever so slightly overcooked. 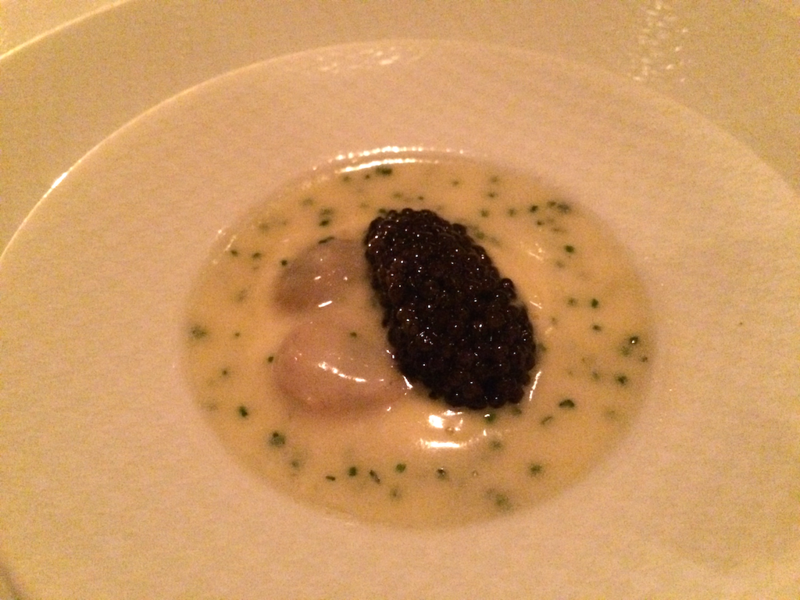 This was the second time I got to enjoy Oysters and Pearls, the first time being a couple of years ago at Per Se in New York City, and it was just as wonderful now as then (as from this point: apologies for the quality of the photographs or their absence). Next up was citrus-cured Pacific yellowtail, served sashimi-style, and accompanied by some crunchy cucumber balls and a wonderfully floral sake granita, that had a lovely long aftertaste. 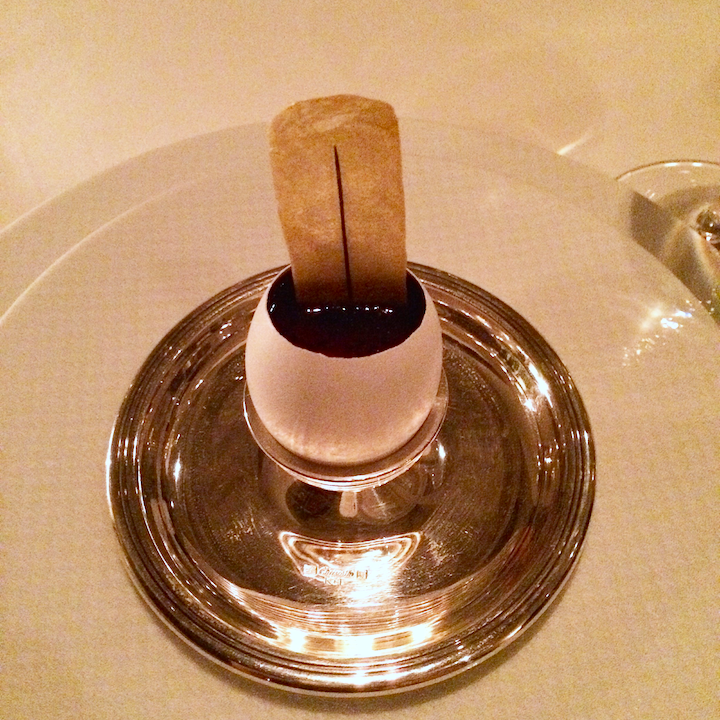 Finally there was a perfectly made hen egg custard that had a mousse-like texture, and was covered with a thin layer of intensely flavoured Perigord truffle "ragout" (jus), and garnished with a thin and crisp chive chip. A heavenly flavour marriage: first you get the creaminess of the custard, followed by the exceptionally sweet earthiness of the truffle; gorgeous. Oysters and Pearls was listed as the first course of the tasting menu, so some of the other canapés/amuse bouches may have been served as complimentary dishes, but I don't know this for sure. Second course was "Hudson Valley Moulard Duck Foie Gras au Torchon". In July 2012 a California state law prohibited the production and sale of force-fed foie gras and restaurants had to take foie gras entirely of the menu. The ban was lifted in January 2015 and I was told that tonight was the first night that foie gras was back on the menu. 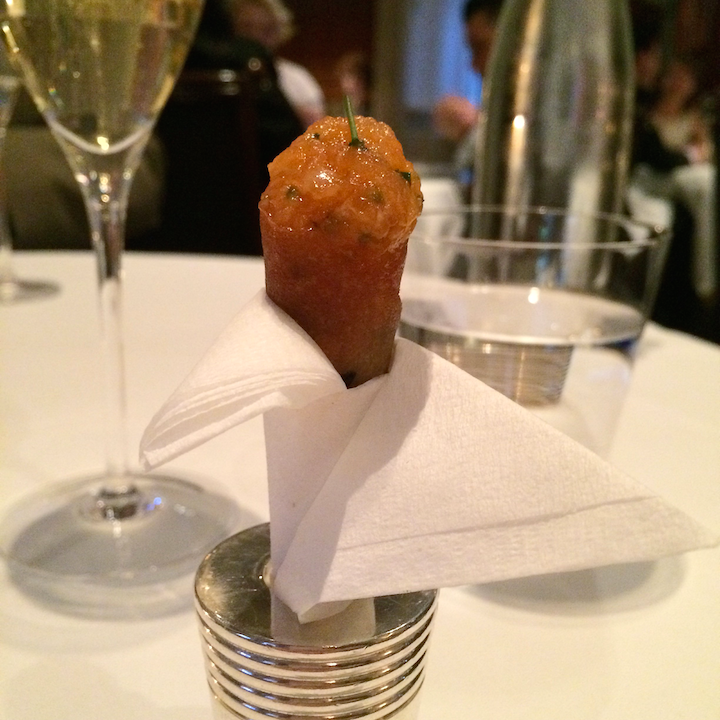 The French Laundry has had a long-standing relationship with top-quality foie gras producer D'Artagnan in the Hudson Valley in New York and their foie gras is prepared "au Torchon" (cylinder shaped, briefly poached and then wrapped in cheesecloth). A thick slice of this foie gras torchon was covered with a layer of glazed crème fraîche and dusted with kumquat powder. Also on the plate was a terrific, pure and concentrated pistachio puree, some kumquat zest, glazed tangerine, caramelised pistachios and Japanese baby turnips. With the foie gras came a selection of no fewer than six salts and a wonderfully buttery brioche bun. Exquisite foie gras, firm in texture but creamy and buttery in the mouth, and the sweet and bitter accompaniments balanced its richness beautifully. I did use some of the salts and they enhanced the superb flavour of the foie gras nicely. The next course was a sole ballotine filled with a salty corned beef farce, served with creamed cabbage, and complemented by a "Thousand Island Gastrique", described as a red wine reduction seasoned with a "gastrique" of strawberry and honey and adorned with coriander oil. Lovely touch of sweetness from the gastrique and the grassy freshness of the coriander oil balanced the dish out nicely. 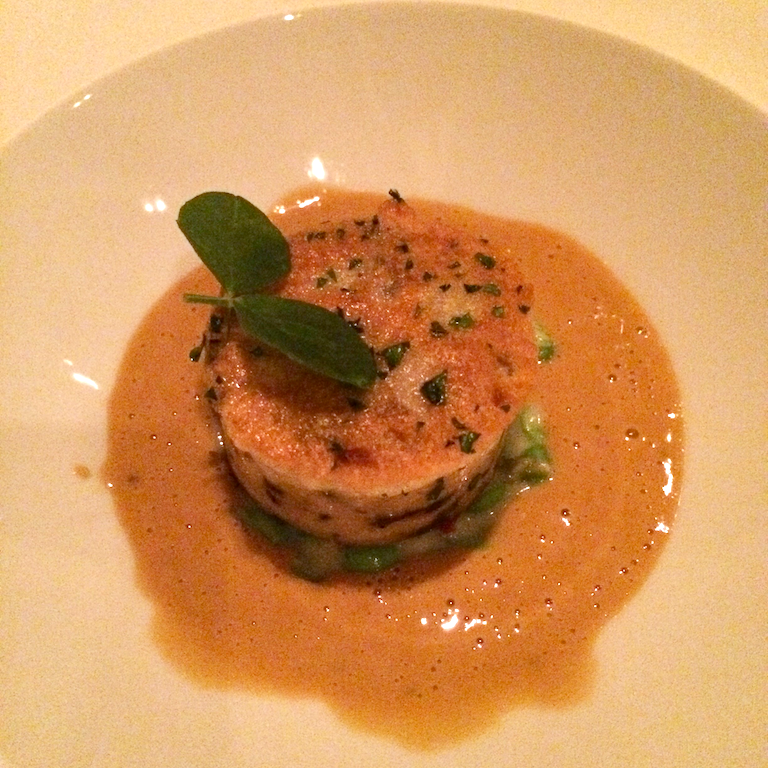 The sole was a bit on the firm/dry side, but otherwise this was a good dish with attractive flavours. 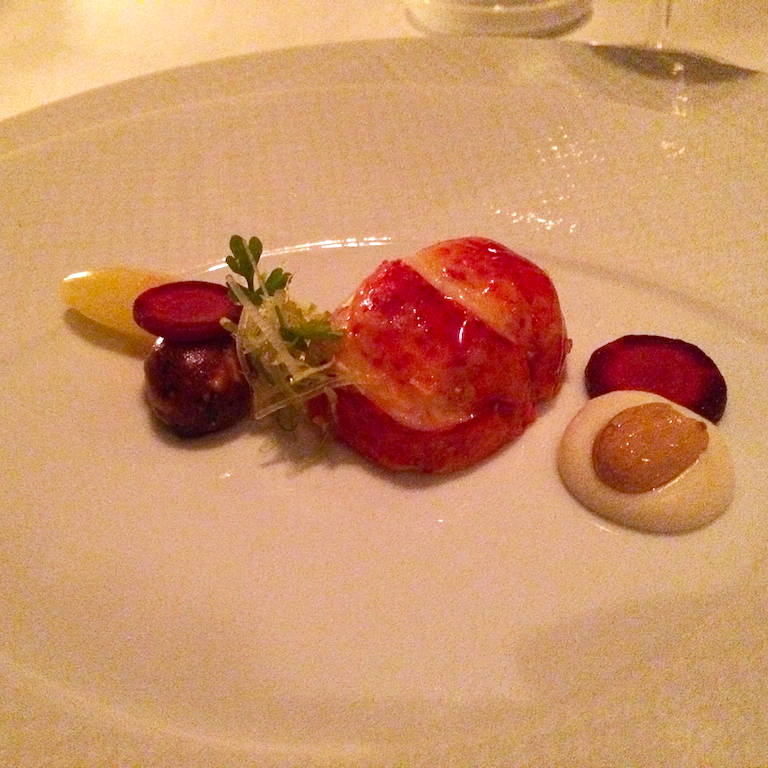 Fourth course was superb Maine lobster, poached in butter, and served with an almond puree, wonderful sweet and sticky dates, celery, almond butter and garden carrot. Perhaps an unlikely gathering of ingredients, pairing almonds with lobster (instead of prawns) and dates with lobster is not an obvious choice, but this made the dish all the more interesting to eat. Overall a delightful dish showcasing some of the US best ingredients. On to the fifth course, an indulgent pairing of a quail roulade, with a wonderfully crisp roasted exterior and a moist centre, and a gorgeous "Blanquette de Champignons" sauce. Underneath the roulade was a delicious mixture of creamed peas with smoked bacon. A fantastic dish that was full of flavour and the ingredients worked incredibly well together. 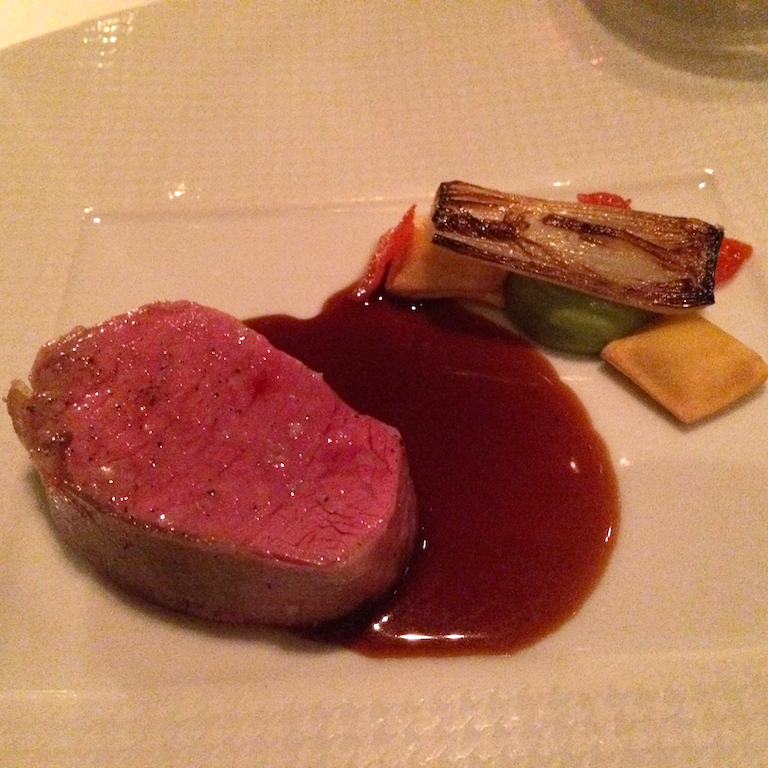 Sixth course was a piece of beautifully cooked lamb, served with a fava bean "hummus", peppadew pepper, caramelised green garlic, two ravioli with a wild garlic puree filling, and a wonderful lamb jus that had been flavoured with sweet pepper. Lovely variety of different garlic flavours, from sweet to mildly sharp, and the lamb-garlic pairing resulted in elegantly sweet lamb flavours. beetroot puree and garden sorrel. The meal concluded with a selection of desserts. First up was a buttermilk panna cotta, served with a crystalised nettle leaf and marinated strawberries, a delightful combination. The only let down, however, was the slightly grainy texture of the panna cotta. This was followed by a lovely dessert of vanilla-pistachio swirl ice cream with edible tutti frutti confetti. Equally good was a cylinder-shaped dark chocolate marquise with a toasted brioche centre and garnished with salted pretzel crisps. And there were some final sweet treats, such as "Coffee and Doughnuts" (Cappuccino Semifreddo and cinnamon-sugar doughnuts), and macarons (peanut butter & jelly and green tea & yuzu). 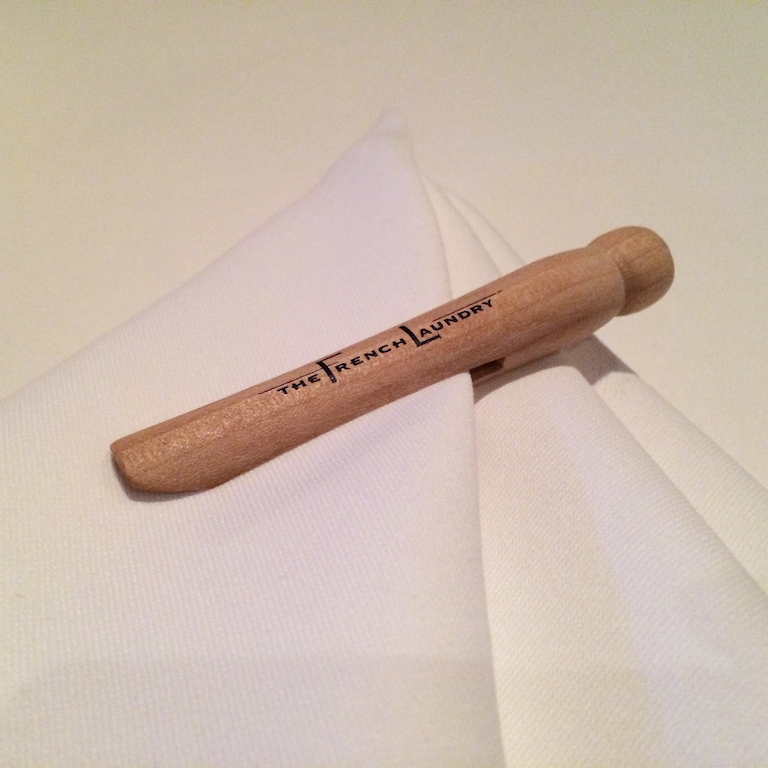 The French Laundry has been critically acclaimed ever since the place opened its doors in 1994. In her 1997 review for the New York Times, Ruth Reichl describes the effect of the food on the diners as "electric" and the review comes with the headline "A Restaurant Scales the Peak". Even though the culinary landscape in America has changed immensely in the past two decades, things haven't changed significantly at The French Laundry. The philosophy was and still is: classically based dishes made with world-class ingredients. One thing has changed, however. Ruth Reichl also mentions in her piece that "Mr. Keller is too irreverent to allow his restaurant to become a temple of food", but somehow this is exactly what has happened. The French Laundry has become the ultimate destination restaurant, a place of pilgrimage for anybody who wants to enter that famous blue door. The restaurant has created many classics that continue to capture the imagination of foodies all around the world. This is especially clear on social media: even a blurred picture of Oysters & Pearls got yours truly 200+ likes on Instagram. Tonight's menu delivered some sparks, but it was not a broadside of three-star fireworks. The minor errors in the execution of some of the dishes were unfortunate, but luckily they didn't spoil them. Also, the restaurant with its new temporary kitchen, had after all just reopened. Nevertheless, there was some excellent craftmanship on display and kitchen produced a number of outstanding dishes with carefully judged flavours and impeccable ingredients. I started my Californian trip, visiting two of the new three-star laureates in San Francisco, Joshua Skenes' Saison and Corey Lee's Benu, the latter having been Chef de Cuisine at The French Laundry for 5 years. Quite unexpectedly my trip ended in the place were Californian haute cuisine began. As soon as you enter that blue door, the proud front of house team at The French Laundry does everything in their power to give you the best and most memorable experience, and they were very successful in doing so at our and all the other tables. You could say I have been French Laundried.